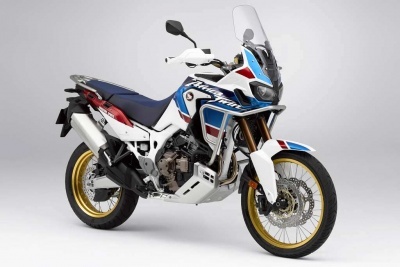 The exciting new Honda Africa Twin Adventure Sports model comes with bars and a skid plate, does it offer the protection I need? Honda states these are not “crash bars” but instead are a “light bar”. Looking at the hardware connecting the light bar to the bike you clearly see the it was never intended to withstand an impact. 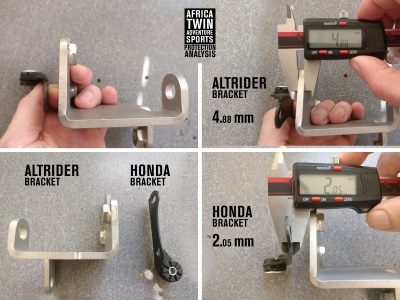 Compare the Honda brackets for the light bar to the brackets for the AltRider Crash Bars. The Honda brackets are 2.05 mm steel and will not take much to bend, in addition the rubber mounts allow the bars to flex into the bodywork. The brackets for the AltRider Crash Bar System are 4.88 mm thick stainless steel, about 2.5 times thicker. Now that your aware, build your bike for the riding you intend to do. In fact, when industry legend Jimmy Lewis and journalist Jon Beck of Dirt Bike Test reviewed the Adventure Sports model they mention the fact that the bar is meant to be a light bar, not a crash bar, see minute 42:00 of their Facebook video. 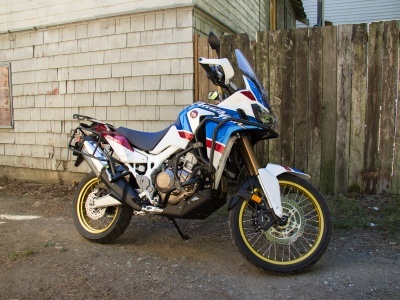 So the Africa Twin Adventure Sports model comes with a light bar, should I consider AltRider Crash Bars? 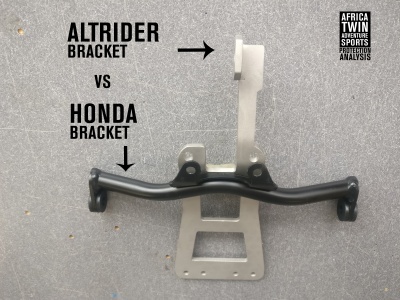 Comparing the Honda Bracket to the AltRider Upper Crash Bar bracket it becomes clear why Honda calls their bar a “light bar” as opposed to a “crash bar”. The black bracket is Honda’s, and the silver bracket is AltRider’s. Notice the Honda bracket has 2 thin tabs that are the entirety of the upper connection, much of the force of any impact will be directed to these 2 tabs that are only 2.05 mm thick. 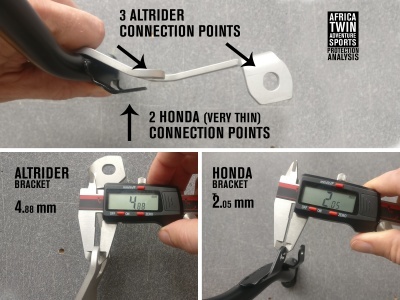 Comparing the connection points it becomes obvious to see why AltRider’s crash bars will offer protection that the Honda system was never intended for. 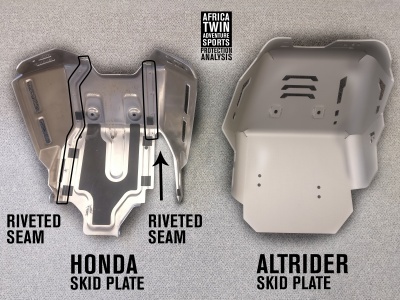 The Africa Twin Adventure Sports comes with a Honda skid plate, why would I consider an AltRider Skid Plate? Honda’s skid plate initially looks impressive, however, there are 2 major flaws: thin aluminum and rivets don’t create an effective skid plate. 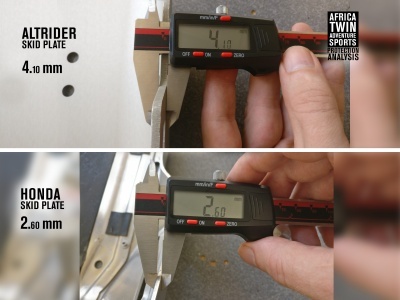 At 2.60 mm thick aluminum the Honda skid plate can be bent by hand, AltRider’s is 4.10 mm aluminum. 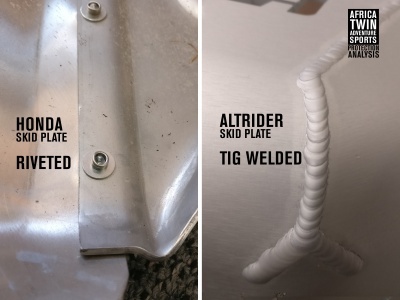 AltRider’s Skid Plate is a single piece with TIG welded seams, designed to take many hits over a long period time. What’s the problem with rivets? Rivets are applied by impact (peening) to expand/flare the rivet, creating a friction joint. The same force that expanded the rivet will occur again when hitting an obstacle, the impact will move the rivet and loosen the seam. Once a weak point on the seam occurs this places extra stress on the other rivets and the seam will eventually fail. TIG welding is a fusion joint vs. friction joint; while a significantly more expensive method, it is ideal for the off-road environment. The new Honda Africa Twin Adventure Sports is an exciting new bike to take you where you want to go! If you’re someone who loves to ride off-road there’s always going to be rough conditions, protect your bike accordingly.